When Google was founded in 1998, its goal was to organize the world’s information. And for the most part, mission accomplished — but in 19 years the goalpost has moved forward and indexing and usefully presenting information isn’t enough. As machine learning matures, it’s becoming feasible for the first time to actually summarize and contextualize the world’s information. With two and a half years of R&D under its belt, Primer aims to do just that for governments, corporations and financial institutions. Primer has collected a total of $14.7 million across Seed and Series A investment rounds led by Data Collective. Lux Capital, Amplify Partners and, In-Q-Tel, an investment firm supporting the CIA, have also provided capital to Primer. The team of 36 employees has been able to close initial customers at In-Q-Tel, Walmart and Singapore’s sovereign wealth fund. Using a mixture of supervised and unsupervised machine learning models, Primer can ingest unstructured data and produce insights — think scouring the web for news related to a specific company and then organizing it into key themes. The general concept gives us flashbacks to the early days of Palantir. But Sean Gourley, founder and CEO of Primer, is quick to point out the difference between the two ambitious companies. “If you want to charge high amounts of money, you can solve valuable problems infrequently or you can solve problems everyone has to deal with on a daily basis and it feels like infrastructure,” Gourley asserted. He’s of course pointing out the notion that much of Palantir’s business model has focused on higher cost consulting services to help corporations and governments meet incredibly ambitious goals. Much hullabaloo has been made over rumors that Palantir’s software played a role in tracking down bin Laden. But Primer is promising considerably less in hopes of an even higher payoff. Primer’s software is being positioned to augment low-level analyst work that manifests itself most commonly in the intelligence community and at big banks. By monitoring large quantities of information semiautonomously, Primer can potentially speed up the process by which research is gathered and presented. Because Primer is being targeted at the intelligence community, Gourley wasn’t able to go into specifics about its capabilities in a military context. However, I was able to watch a demo of Primer Science, a version of Primer adapted to help academics monitor the regular release of new papers. The version I saw was able to identify key machine learning papers published on ArXiv and contextualize them alongside social media postings and news reports. The platform made it easy to identify work completed by key research groups and quickly locate papers focusing on specific sub-topics like machine translation. Collecting information in a single place is really the only way to consider events from every angle. Unfortunately, piles of information can quickly overwhelm even the best human analysts and critical details can go unnoticed. Gourley gave me the example of news coverage to make a similar point. Press in every country cover events differently and its advantageous for someone tasked with gathering intelligence to look for disparities. 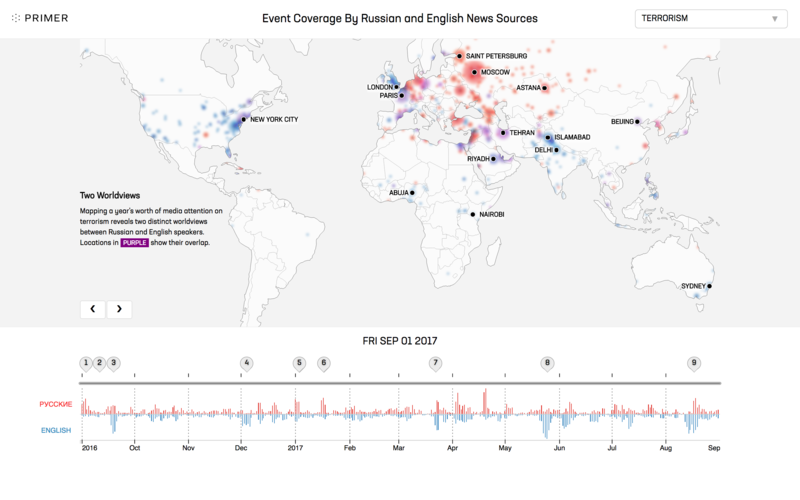 The graphic below (and an interactive visualization here) shows contrasts in the coverage of terror events by U.S. and Russian media. For less high-stakes corporate and financial users, Primer can classify common events like regulatory changes, product launches and M&A transactions. More long tail concerns are still flagged as interesting and human analysts can provide feedback, further training models to provide better insights the next time a similar event happens. Training models can be a challenge for companies that operate in industries where data is very tightly controlled. Gourley explained to me that most customers are ok with using at least some of their data to improve models but that things can get tricky when it comes to feedback into the significance of findings. The hope is that Primer can some day assist in prediction making by looking for statistical correlations between events. Such an effort would undoubtedly require strong synergies between human analysts and Primer’s technology.